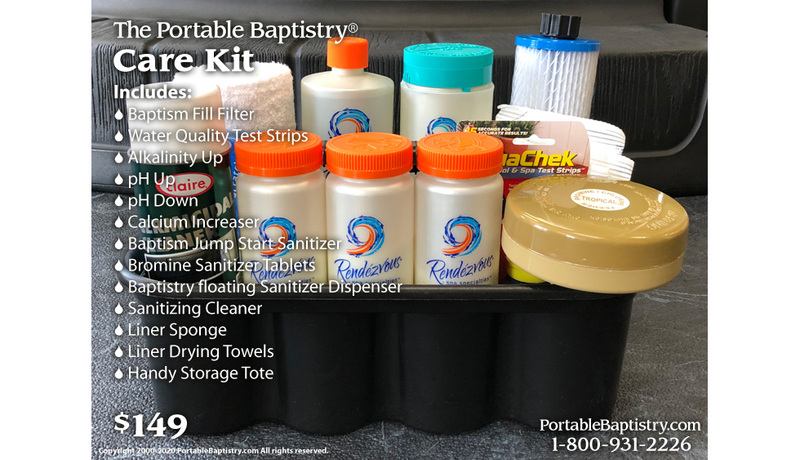 The Portable Baptistry Care Kit is a convenient assortment of sanitizing related items assembled to help you better manage the basic water quality of your Portable Baptistry and maintain a safe and healthy user experience. Addressing water quality concerns, especially when baptizing numerous candidates and when having multiple baptism services with the same water, the Sanitizer Kit includes the items that will help you better manage baptism water quality with little or no fuss. The generous supply of Care Kit ingredients should provide peace of mind for numerous baptism services. Copyright © 2000-2019 PortableBaptistry.com All rights reserved. The Portable Baptistry is a product and trademark of PortableBaptistry.com Patent pending. Serving ministries like yours worldwide for over 25 years!